Ideal for entertaining large audiences. 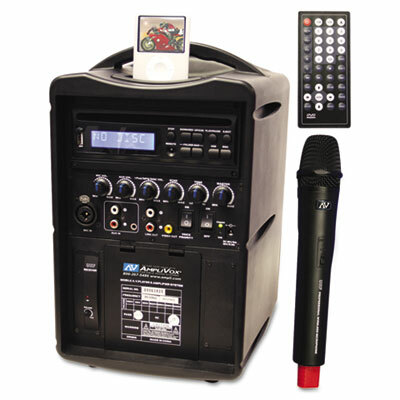 Entertain audiences up to 500 people with this PA system that’s made for sharing a full multimedia experience. Play music and recharge your iPod® or iPhone® with the built-in docking station. Integrated DVD player with video out jack lets you connect a projector or other video device to show movies to the whole crowd. Make clear announcements anywhere in the room, thanks to the wireless receiver and microphone. Voice Priority Switch automatically mutes the music when you speak into the microphone. Lightweight design and comfort-grip handle make it easy to carry.